Social Data Analytics is the first practical guide for professionals who want to employ social data for analytics and business intelligence (BI). This book provides a comprehensive overview of the technologies and platforms and shows you how to access and analyze the data. You'll explore the five major types of social data and learn from cases and platform examples to help you make the most of sentiment, behavioral, social graph, location, and rich media data. A four-step approach to the social BI process will help you access, evaluate, collaborate, and share social data with ease. You'll learn everything you need to know to monitor social media and get an overview of the leading vendors in a crowded space of BI applications. 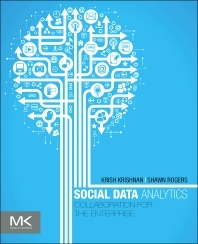 By the end of this book, you will be well prepared for your organization’s next social data analytics project. Shawn Rogers joined Enterprise Management Associates in 2010 as vice president of the business intelligence (BI) practice area. In this role, Rogers delivers comprehensive coverage of the business intelligence and data warehouse technology stack with a focus on database technology, data integration, business intelligence management solutions, reporting, analytics, performance management, as well as emerging technologies such as SaaS BI, embedded BI and social BI. Shawn has more than 19 years of hands-on IT experience, with a focus on Internet- enabled technology. In 2004 he co-founded the BeyeNETWORK and held the position of Executive Vice President and Editorial Director. Shawn guided the company’s international growth strategy and helped the BeyeNETWORK grow to 18 Web sites around the world, making it the largest and most read community covering the business intelligence, data warehousing, performance management and data integration space. Prior to co-founding the BeyeNETWORK, Shawn was Internet Business Development Director at Thomson Media (now SourceMedia), President of Achieve Communications and a partner at DMReview magazine (now Information Management) – where he was Vice President as well as Publisher and Editorial Director of DMReview.com, a leading business intelligence and data warehousing Web site.